Use Perfect Property to find your next perfect house to buy in Palmerstown. Palmerstown is a lovely and quiet nieghbourhood located 8.7km west of Dublin’s city centre. It is about a 15-minute drive by car via the R148, N4, and M50 Motorways. A number of Dublin Bus routes primarily service the town. 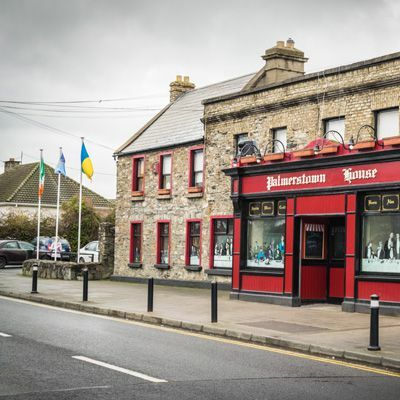 Palmerstown is an excellent place for families of all ages, as it is in close proximity to the city centre, while still maintaining its cosy country stature. Palmerstown homes are traditional in architecture but are updated with modern fixtures. Residences are treated to views of the beautiful River Liffey, vast countryside, verdant parkland, blossoming gardens, mature trees, and delightfully manicured and landscaped acreage. Palmerstown houses represent old-world styles, and one can expect to find a mix of Victorian, Mid-Century, Georgian, country, cottage, modern, Tudor, and contemporary home styles. New construction and refurbished dwellings are appointed with modern amenities, tasteful décor, spacious living accommodations, and sustainable energy efficiency. Many homes are within convenient walking distance to leisure activities. Palmerstown offers many shopping amenities in the Village Shopping Centre, including retail shops, convenience stores, banking, health care facilities, supermarkets, and small businesses. The town is also in close proximity to the large Liffey Valley Shopping Centre, which includes all conceivable amenities. Palmerstown is also host to a number of delicious restaurants, cafes, and pubs. Recreation, leisure, and sporting clubs are plentiful in Palmerstown, including Stewarts Sports and Leisure, Glenaulin Sports Park, GAA Club, Palmerstown F.C, nearby Phoenix Park, bowling, rafting, and plentiful trails for walking, cycling, and picnicking. Palmerstown is home to a number of primary, national, and secondary schools, as well as a Scoil school. Academic excellence is a high priority within the town. Palmerstown school awards include BT Young Scientist Award, Green Flag School Award, Universal Design Grand Challenge Student Awards, Irish Water Winner, Special Ambassador School Euroscola Competition, and sporting awards. You can filter Palmerstown properties by price, bedroom size, square footage and more. There is also the option to filter by a property must-have, such as a large kitchen if you are seeking a house to buy in Palmerstown where the whole family can cook, or even large bedrooms or a garage. You can also check apartments for sale in Palmerstown if you are looking for something a little smaller. Don't let the perfect apartment, townhouse or house for sale in Palmerstown get away. Looking to rent in Palmerstown? Search houses for rent in Palmerstown and filter by home types, price and size.